The Simms Women's BugStopper Hoody is a women's fishing hoody by Simms that utilizes COR3 Technology and is made with 58 percent polyester and 42 percent polyester. 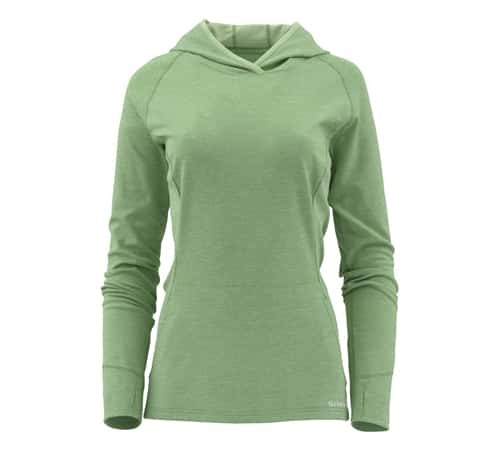 This women's hoody has wicking properties and is anti-odor and has UPF50 sun-blocking protection to help protect your skin against harmful sun rays while you're fly-fishing at your most favorite fishing destinations while wearing this women's hoody. This Simms Women's BugStopper Hoody has an articulated hood with extended coverage that provides anglers with improved protection against the elements while fishing. The Simms Women's BugStopper Hoody has an extended cuff with thumb loops that also provides better coverage while fishing when wearing this women's fishing hoody. The Simms Women's BugStopper Fishing Hoody is designed with raglan sleeves to provide women fly-fisherman with much improved easy of movement. Also included are flatlock seams for added comfort in this women's hoody. I wore this bugstopper hoody every time I went camping last summer and I NEVER got a bug bite on my upper body. I even walked through mosquito filled areas near the water with the hood up around my face and never got bit. I HIGHLY recommend this hoody if you're going to be anywhere around mosquitos.